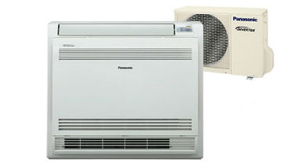 The slim, elegant and space-saving design of these single-split, floor-console Inverter heat pumps hides powerful performance, energy efficiency and a host of home comfort features. Compact, elegant, super-quiet and highly efficient Floor Console range of single-split Inverter heat pumps, providing up to 7.10kW capacity output (CS-E18GFEW model) with heat down to -15ºC. Despite their compact size, our Floor Console models offer both high capacity and an energy-saving performance that places them at the top of their class industry-wide. Designed with colder climates in mind, the Floor Console range is still capable of heating your home while it’s -15ºC outside. And thanks to Panasonic Inverter technology, all the benefits of an Inverter system are present – including quick comfort thanks to powerful output right from the start; and quiet, efficient, energy-saving operation thanks to flexible power control. While our Floor Console models provides plenty of heating and cooling power, they also feature industry-leading quiet operation for greater comfort: both the CS-E9GFEW and the CS-E12GFEW indoor units can be set to run as quiet as 23dB – almost as quiet as leaves rustling on a tree. Furthering the benefits of installing a Floor Console is the Upper & Lower Vane design – providing bi-directional airflow that warms the whole room uniformly, right down to your toes.